HP Indigo Division is a division of HP Inc.'s Graphic Arts business. It was founded in 1977 as the Israeli company Indigo Digital Press and bought by Hewlett-Packard. It develops, manufactures and markets digital printing solutions, including printing presses, proprietary consumables and workflow. The firm was an independent company until it was acquired by HP in 2001. 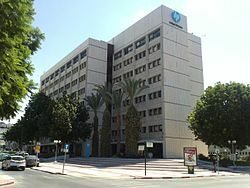 HP Indigo has offices around the world, with headquarters in Nes Ziona, Israel. Customers of HP Indigo solutions include commercial printers, photo specialty printers, and label and packaging converters to print applications such as marketing collateral, photo albums, direct mail, labels, folding cartons, flexible packaging, books, manuals, and specialty jobs. The ability of digital presses to print without plates enables the use of variable data, such as text or images, in personalized direct-marketing applications, or in photo albums, which are usually printed in copies of one. Because the workflow is done entirely digitally, with the printing taking place only at the very end, digital presses also make short-run and just-in-time printing cost-effective. In this way, digital presses have changed the economic models for printing in a wide variety of market segments, cutting down on supply-chain costs and simplifying the creation of marketing campaigns that reach consumers in more creative, personalized ways. The HP Indigo printing process is notable for its seven color stations (hence three more than the standard CMYK printing process colors), as well as the wide variety of specialty inks offered. Custom colors are also available, and users can also mix their own colors on-site as they like; inks can be interchanged as desired. The Indigo process is also noted for its highly reliable color-to-color registration, given that each image is incrementally built up on a drum-shaped imaging blanket, ink-by-ink, and is then transferred to the paper in one shot at the end. Inks can be laid down in any order desired, and multiple layers of each ink are also possible. The name Indigo comes from a company formed by Benny Landa in 1977. Landa, known as the father of digital offset color printing, was born in Poland to post-World War II Jewish refugee parents, who later immigrated to Edmonton, Alberta, Canada. Landa's interest in printing goes back to the time he worked as a child in his father's photo shop. His father purchased a cigar store that had a small photo studio in the back which he developed, using his skills as a carpenter, into his own portrait studio. While a student in London, Landa was employed at Commercial Aid Printing Services (CAPS), a company offering printing services and microfilm solutions. Landa was instrumental in developing a solution that won the company a contract with Rolls Royce, and was appointed as Head of R&D. However, CAPS lacked manufacturing capital and went into receivership in 1969. In 1971, Landa joined Gerald Frankel, the owner of CAPS, and founded a new company - Imaging Technology (Imtec). Landa led Imtec’s R&D activities and invented the company’s core imaging technology. While researching liquid toners at Imtec, he worked on a method of high-speed image development that would later lead to the invention of ElectroInk. At the start of the 1990s, Indigo moved from a primarily research-driven business into a full-scale printing equipment manufacturing company. The company's first product would be a digital plotter/duplicator, bringing the tiny company (its 1991 sales totaled less than US$5 million, generating a profit of $440,000) head-to-head with such industry giants as Xerox and Canon. In 1993, Indigo launched the E-Print 1000 at IPEX trade show. The E-Print 1000 eliminated the expense and labor of the plate-printing setup process by printing directly from a computer file, thereby simultaneously enabling inexpensive short-run color printing. Images not only could be readily changed, they could be changed from page to page, requiring neither additional setup nor pauses in the print run. Instead of printing to metal plates, the E-Print created a latent image on the drum-shaped Photo Imaging Plate (PIP) through the use of an electrostatic charge. This charged area would then attract the charged ElectroInk, which would in turn be transferred to the ITM or blanket. In the final step, the ink would be transferred from the blanket to the paper or other substrate. Because 100% of the ink is transferred from PIP to blanket to substrate, a different image and color could be printed with each rotation of the PIP. This multi-step electrostatic process, combined with the wide range of ElectroInk colour possibilities, offered print quality rivaling that of traditional printing processes. Over two decades years later, and despite the numerous technological improvements, all Indigo presses are still based on this core technology. In 1994 Indigo had an initial public offering on the NASDAQ stock exchange, selling 52 million shares at $20 per share and raising $100 million. The offering reduced Landa's personal holding in Indigo to 70 percent. As the stock continued to climb, the following year, Landa's paper worth reached some $2 billion by 1995. At the drupa trade show in 1995, Indigo launched another product: the Omnius press. Whereas E-Print focused on medium-volume single-sheet printing, Omnius brought digital printing to a variety of surfaces, including plastic, cardboard, film, and, especially, cans, bottles, and other packaging surfaces. Omnius was the precursor of today's portfolio of Indigo's labels and packaging presses. At the end of 1995, Indigo sales did not reach the expected levels, and the company found itself overstaffed. Despite a strong rise in revenues to $165 million, the company posted its fourth year of losses, of about $40 million. However, George Soros still believed in the company’s potential and increased his investment to 30 percent of Indigo's shares by 1997. By 1998, the company improved its financial performance and revenues passed the $200 million mark for the first time. In the following years, HP continued to invest in Israel-based graphic arts companies, acquiring Scitex Vision in 2005 and Nur Macroprinters in 2007. Other employees of HP in Israel (which includes not only employees of the Indigo division, but also of Scitex and Israeli's divisions of HP Labs) made it the second-largest foreign employer after Intel. Under the ownership of HP, Indigo developed and grew to become a world leader in the digital print industry. In 2002 they announced the first product manufactured jointly with HP: the HP Indigo 5000, and their second generation of products (known internally as "series 2") was born. Other products belonging to these series were the roll-fed ws4000 series. At drupa 2008, Indigo announced the Indigo 7000 digital press, with over 70% higher productivity over series 2. This product further pushed the break-even point versus offset lithography and enabled more pages to be economically viable on Indigo. Other presses unveiled at drupa included the double-engine Indigo W7200 and the new derivative for labels, the Indigo WS6000. In August 2009, HP announced they had reached 5,000 HP Indigo digital presses in operation around the world. The company is ranked No. 1 in the US high-volume digital press market and, according to HP officials, has a 75% share of the world market for digital commercial photo printing. In March 2012 HP Indigo unveiled the Indigo 10000 B2/29" digital press and released it to market a year later. By March 2016, there were over 200 Indigo 10000 customer installations in over 20 countries. In 2014, HP Indigo marked the launch of the new 20000 and 30000 digital presses, aimed at the packaging markets. The presses target flexible packaging converters, label converters and folding carton establishments. In 2016 Indigo announced a new portfolio based on innovation on four core pillars of their technology: quality, color, applications and productivity. They also announced PrintOS, a cloud-based platform to help customers. HP Indigo uses a proprietary, patented technology and a business model that sells both presses and their consumables, as well as services. The presses are assembled in a dedicated facility in HP's Kiryat Gat campus, and the inks are manufactured at both Kiryat Gat and TUAS, Singapore. Today, more than 8000 HP Indigo presses are in use in 122 countries worldwide. They include some of the largest names in print world, including Cimpress and Consolidated Graphics (now part of RR Donnelley), but also a wide variety of small and medium-sized print service providers and labels and packaging converters. According to Indigo GM Alon Bar-Shany, the volume printed on Indigo presses grew by over 50% from 2012 to 2016, reaching an estimated 30 billion pages. The year 2005 marked the creation of Dscoop, the independent user's group of Indigo and HP Graphic Arts solutions. By 2015, it had reached over 7000 users, including owners and technical personnel. Dscoop membership is free of charge for HP Graphic Arts users throughout the Americas, Europe, the Middle East and Africa, Asia Pacific and Japan. There are several families of HP Indigo presses, which can be broadly grouped by the type of paper-handling mechanism they work with: Sheetfed (or cut-sheet) or Webfed (or roll-fed). In addition to the core set of Indigo printing functionalities that all of these models have, certain models in each group are also capable of printing embossed-style textures, raised print, digital watermarks, and special effects such as a thick vanish overlay. Intricate, high-resolution security-type patterns can be printed as well. The launch of the HP Indigo 10000 digital press in 2012 marked the first time the company embarked on a platform capable of supporting a paper size beyond A3, the B2/29.5" paper format. In 2016, Indigo introduced the 80 metres-per-minute roll-fed 80000 press for label production. Also in 2016, HP announced the B1-sized roll-fed Indigo 50000. This flagship model, which can print 30 inches wide by unlimited length (e.g. banners), was released in 2017. At drupa 2008, Indigo unveiled a new workflow strategy for their portfolio called HP SmartStream, based on their own development and on partnerships with other industry vendors. Among the announcements was a [web-to-print] product in partnership with Press-Sense (later bought by Bitstream makers of Pageflex.) They also released new versions of their Digital Front Ends (DFEs). In 2004 HP made a 100 million shekel investment in a new production site in Kiryat Gat, Israel. The factory is responsible for manufacturing HP Indigo ElectroInk. There is a sister facility in Singapore that also manufactures Indigo ElectroInk. In 2007, an adjacent hardware center was opened in Kiryat Gat. This facility assembles frames, feeders, and other components with imaging engines into finished presses, and also serves as the site for manufacturing other operator-replaceable consumables, such as the blanket. In late 2012, HP Indigo inaugurated a second ink plant in Kiryat Gat, which will focus on the manufacturing of ElectroInk for the new family of presses: the HP Indigo 10000, 20000, 30000, and 50000 digital presses. This 118,000 square feet facility is reported to be the first building in the country and the first HP manufacturing facility worldwide designed to meet the LEED Silver environmental standard. Early incarnations of the press (Series 1 engines) were prone to banding and ink adhesion problems. However newer models have corrected these issues. The newer models also include inline spectrophotometers for constant monitoring of output image quality. Due to the use of ethylene co-polymers used in the electroinks used by the Indigo printing process, there is some debate on the ability to recycle the print from Indigo presses. ^ Francis, Jo. "HP Indigo in Bullish Mood at LabelExpo". PrintWeek. ^ "World Market for Digital Packaging and Labels to Reach $15.3 Billion by 2018". ^ Yeager, Brian. "Bitstream to Acquire Assets of Press-Sense".